Influenced by a wide variety of musical genres and drawing on life experience gained from international aid work, parenting, marriage and travel, this vibrant duo has been building a catalogue of music since 2005. If succeeding in life is entwined with finding the best ways to navigate the complex intersections between personal goalposts and emotional desires, not to mention the many minefields strewn across our daily societal challenges, then discovering the yin to one’s yang can certainly make the journey that much more pleasurable. Achieving a certain level of intuitive, zen-like balance is a rare find indeed, and it’s something that also describes the synergistic working dynamic between China and Seth Kent, the powerhouse husband-and-wife songwriting team who drive the Denver-based alt-folk collective known as Alright Alright. 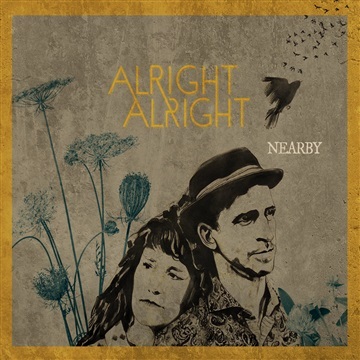 Alright Alright are pleased to share the universality of their interconnectivity via the words and sounds that comprise their seductively atmospheric full-length debut album Nearby, which was produced by the duo with Eric Dawson Tate and Ben Wysocki, mixed by Eric Dawson Tate, and mastered by Alan Douches of West West Side Music and is set for release on October 5, 2018 by Hooves And Sugar Record Co. From the strings-and-choir-driven wishing-well aspirations of “Be Kind” to the slow-building smoky-twangy revelations of “By the Bed” to the zeitgeist temperature-taking of “Luckiest Girl in America” to the harmonic bent-truth yearnings of “The Liar,” Nearby deftly carries the listener through each gripping, successive chapter of the ever-growing, ever-evolving Alright Alright saga. As you can already tell, each Kent channels an impressive C.V. into Alright Alright’s musical DNA. China attended Vanderbilt University and is a classically trained pianist, while Seth has spent time on record and on tour as a guitar tech with the super-successful Denver-bred alt-rockers The Fray (“Over My Head (Cable Car),” “How to Save a Life”). Together, the Kents have also helped compose the scores for a number of fine independent films including Brick, Blue State, The Brothers Bloom, and Jam. The sonic scope of these scores, well, underscore just how adept the married duo are when it comes to bringing such cinematic sensibilities into their own work. 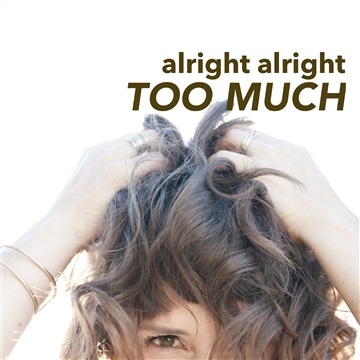 It’s a level of commitment and joy that speaks to the overall good vibes and deeply personal nature of Alright Alright’s music on Nearby — which is about as close as you can get to the heart of the matter. As Seth observes, “Every day, one of us will look at the other and say, ‘I’m so glad I’m doing this with you.’” Even though Alright Alright once wrestled with ending their story entirely, Nearby delivers on the promise of many exciting new chapters to come.